A soil compactor, also referred to as a road roller or pad foot compactor, plays a vital role in the preparation of surfaces for projects such as construction and road building, as well as at landfills and agriculture sites. Caterpillar® manufactures a variety of large compactors featuring an innovative tamping wheel tip design that maximizes soil density. Like all Cat® machines, the line of soil compactors will also allow you to complete jobs faster and more efficiently, which will keep your projects on schedule and have a positive impact on your company’s bottom line. Call us today at (317) 803-2526 for more info on soil compactor rentals. Looking for smaller compactor rentals? 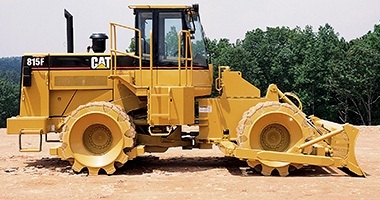 Visit MacAllister Rentals for small rollers and compactors. 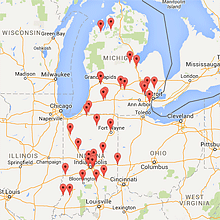 If you’re in Indiana and are looking for a soil compactor on a temporary basis, look no further than the nearest MacAllister Machinery location. As an authorized Cat equipment dealer, we offer an extensive fleet of large compactor rental units from the worldwide heavy equipment leader, designed to handle your most daunting job site challenges. Our experienced rental staff will help you find the perfect machine that meets your project’s requirements and fits your budget. Our pad foot compactor rental inventory consists of late-model, low-hour machines that have been expertly maintained by our team of experienced service technicians. Depending on availability, we may also have older Cat models and products from other leading manufacturers. We’ll work hard to get your compactor to you as quickly as possible, or you can choose to pick it up at one of our conveniently located MacAllister Machinery stores. We back all our heavy rentals with prompt field service in the event of an unexpected breakdown. You’ll also enjoy the benefit of flexible terms whether you choose to rent a large compactor for a day, week, month or longer. A large compactor rental from MacAllister Machinery is the perfect short-term solution if you’re seeking a fast replacement for a machine that’s temporarily out of service. It can also serve you well in the long term, such as when taking on an increase in projects that will keep your company busy for several months. Renting can provide a cost-effective alternative to purchasing, especially if your company needs to allocate its available capital for other resources. What’s more, you’ll avoid incurring the costs that come with equipment ownership such as fleet management, maintenance and storage. MacAllister Machinery is the trusted Cat equipment dealer in the region since 1945. We’ve built our reputation on providing superior products and unmatched customer service, which is what you can expect when you contact us for a large compactor rental unit. View all our pad foot compactors by browsing our heavy rental product guide. You can also give us a call or contact us online for additional product and pricing information.